Designed for FM radio transmitters, these Teflon splitter combiner assemblies are ideal for splitting and combining FM signals in the 88-108MHz frequency range. Splitter combiners are useful for combining RF amplifiers to obtain high power levels. They are also used on multi-bay antenna setups. This combiner will handle up to 1000 watts because of its extremely low loss characteristics and Teflon construction. These combiners should not be used to combine 2 600 or 700W Pallets. Use 2000W combiner for that unit! These combiners and flange mount 100 ohm resistor must be secured to a heat sink to insure a good ground and to keep the pcb cool. The back side of the pcb can be coated with a very thin layer of heat sink compound. All mounting holes should be used. The resistors are not attached to the PCB. We leave this job to the end user. An AutoCad/DXF file showing the mounting hole locations is available upon request. The table below summarizes the typical performance of our splitter/combiners. You will find that our combiners offer state of the art performance at a low price. Who else sells a high power combiner on a Teflon/ceramic substrate? - Specifically designed for combining 2 RF amplifiers or driving 2 antennas. - 1000 watt power rating. - 0.12dB maximum power loss. - PCB measures 4.94 inches x 3.18 inches. - 250 watt 100 ohm power balancing resistor. - PCB is Teflon with ceramic filler; 2oz copper. Tightly controlled dielectric constant. - Non-reactive; this means you can use 3 boards to create a 4 way combiner! - Guaranteed not to burn under high SWR conditions. 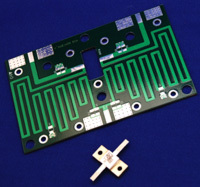 The splitter combiner set includes 2 Teflon Combiner PCB's and 2 resistors as listed below. (1) The axial leaded resistor 100 ohms 5 watts is ideal for low power situations like at the input of a pair of pallet amplifiers. (2) The 250 watt 100 ohm flanged resistor is intended for use at high power. This product was added to our catalog on Thursday 01 November, 2007. Copyright © by PCS Elektronik d.o.o.